When police arrested Donald Smith for the 2008 carjacking and murder of a preschool teacher in Gwinnett, Ga., it seemed certain they had the right man. Smith matched witness descriptions, he seemed to appear on nearby surveillance camera footage and there was DNA evidence apparently proving he was at the scene of the crime. Throughout it all, though, Donald Smith earnestly claimed that he didn't do it and instead offered an usual defense. 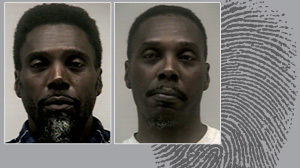 He said his identical twin brother, Ronald Smith, was to blame, according to police. When investigators followed up on Donald's claim, they found a trump card in his favor among a battery of other evidence: Fingerprints at the scene of the crime did not belong to Donald but to Ronald Smith. Even though identical twins share the exact same DNA, they do not share the same fingerprints. After he was presented with the evidence against him, Ronald Smith admitted to the crime, police said. Ronald's attorney, Lawrence Lewis, said he has need seen the alleged confession and maintains his client's innocence. "This is an unusual case," Gwinnett County Police Cpl. David Schiralli told ABC News. "No. 1, I'm glad that we were able to find the right brother and that we were able to find evidence to exonerate the other brother. Our investigators were faced with a tough task, dealing with identical twins." In a justice system that often relies heavily on high-tech DNA testing, it was fingerprinting, a practice more than a century old, that succeeded where DNA failed. It's thanks to a very similar case from 107 years ago that fingerprinting is today just as critical to investigations as the much newer DNA evidence. At the turn of the 20th century, investigators had tinkered with fingerprinting, but the technique was not widely used, according to the FBI archives. Rather, to identify suspects, investigators relied on the much-trusted Bertillon system, which "measured dozens of features of a criminal's face and body and recorded the series of precise numbers on a large card along with a photograph," FBI records said. That system, which had been used by investigators following its initial implementation in 1882 in Paris, met its match -- so to speak -- when convicted criminal Will West was marched into Leavenworth federal prison in Kansas in 1903. According to the FBI, the story goes like this: The admissions clerk at the prison thought he recognized West and asked if he'd ever been incarcerated there. West twice replied that he certainly hadn't. The clerk took West's Bertillon measurements, went to the files and came back with a card for "William" West, thinking he had his man. The only problem was, the back of the card showed that William West was already in Leavenworth, serving a life sentence for murder. In a July 29, 1919, article, The New York Times called it "the remarkable case of 'dual identity.'" Two men, Will West and William West, apparently looked almost exactly alike, measurements and all. The FBI said they "may have been identical twins." To be sure, officials checked Will's fingerprints against William's and clearly showed they were not the same person. By 1904, the prison abandoned the Bertillon system and started fingerprinting all its inmates. Twenty years later, J. Edgar Hoover formed the Division of Identification within the fledgling FBI and allowed local law enforcement to submit fingerprints so that each could be housed in a single national database. The Bureau could then coordinate and "provide identification services" to various enforcement agencies. The impact of fingerprinting ever since has been immeasurable in the law enforcement field, said former FBI agent and ABC News consultant Brad Garrett. "It's hard to quantify" the number of cases in which fingerprinting aided convictions, "but that's going to be a very large number," Garrett said. ABC News' Melissa Lenderman contributed to this report.